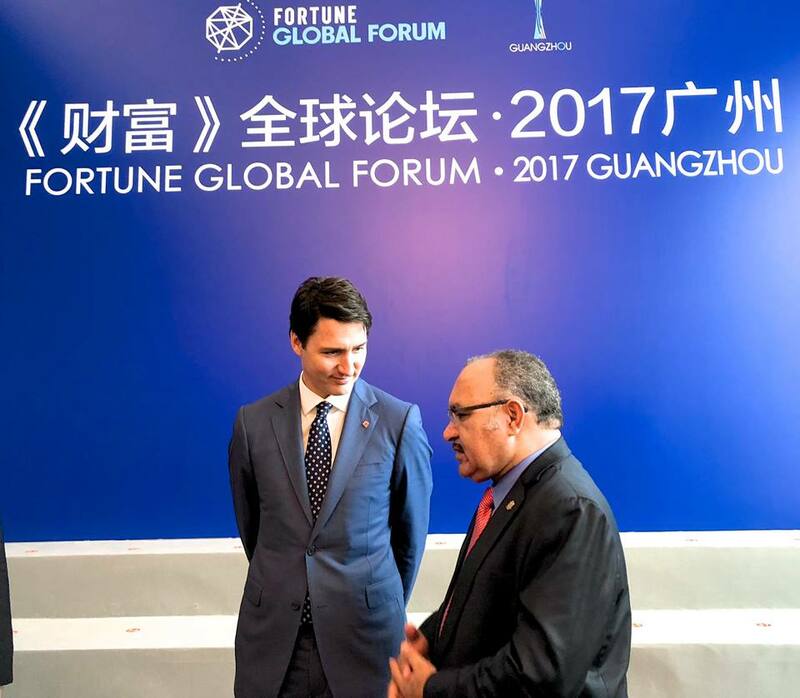 Papua New Guinea Prime Minister, Peter O’Neill , has invited leading business leaders from China to join with other global leading business leaders at the APEC 2018 CEO Summit in Port Moresby next year. Speaking alongside the Prime Minister of Canada, the Rt. Hon. Justin Trudeau, and Vice Premier of China, H.E. Wang Yang, at the Fortune 500 Global Forum in Guangzhou, China, this morning, the Prime Minister also promoted that key elements of the APEC 2018 agenda. “Logistics and security preparations are underway for Papua New Guinea to receive the 15,000 delegates and businesspeople, as well as world leaders, who will attend APEC events next year,” the Prime Minister said. “The first meeting of APEC 2018 actually began today in Port Moresby with the Informal Senior Officials Meeting, and I am advised that it is proceeding well. “The 2018 APEC policy agenda is also evolving and has a focus on inclusion and the digital economy, which is important for people in all countries. “The digital future, and the opportunities that are before us, are beyond anything we could have imagined just a generation ago. “But access to these technologies must be inclusive. “We need to make sure people right around our countries can have access to the Internet, online services and banking, particularly in remote and rural areas. “We must endeavour to leave no-one behind, to be inclusive and share opportunity, and this is the focus of APEC work on these issues. In his address, and in a subsequent bilateral meeting with Vice Premier Wang, the Prime Minister highlighted the business opportunities that are evolving in Papua New Guinea for global investors. “Papua New Guinea is not a country that will stand-by and wait for investment to come to us. “We are proactive, and engage with partners around the world to highlight the opportunity that our economy offers. images: Papua New Guinea’s Prime Minister, Peter O’Neill, with China’s Vice Premier, Wang Yang, and Canada’s Prime Minister, Justin Trudeau, at the Fortune Global Forum today in Guangzhou, China.